Walking back from a coffee at Top Pot Doughnuts, we came across a front yard sale, offering numerous hardwood tables and chairs. We inquired as to their provenance, and were told they were all from a decommissioned coffeeshop. 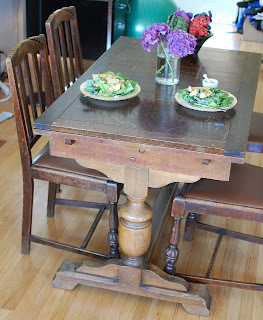 Although we picked chairs that did not match the table, I am very pleased with the result. The table has two leaves which increase its length by 2/3rds. I think it's all oak.